Leave everyday life behind and let yourself be transported to a heavenly place with white sand beaches, crystal clear waters and glorious peace and quiet. Are you looking for a holiday destination that will take you off the beaten track, to empty white sandy beaches and crystal clear waters? Well, you don’t have to travel too far. 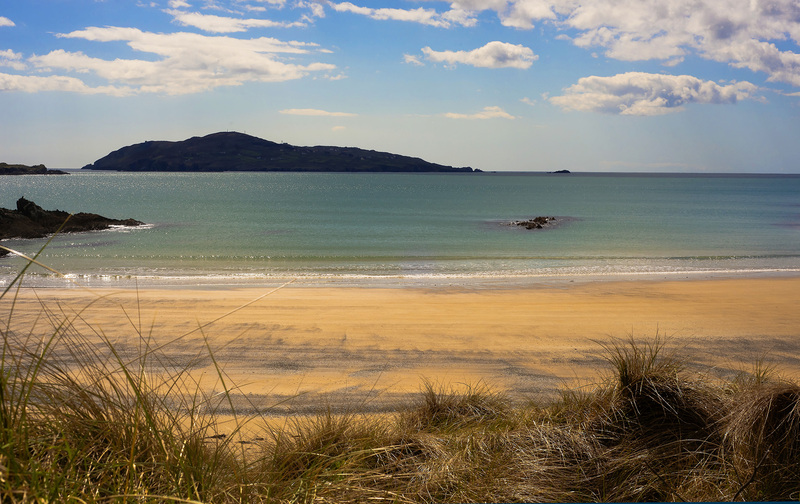 Ireland is home to a number of incredible island getaways that offer epic views, total relaxation and an abundance of adventures to boot. With a population of just 140 people, Rathlin Island is the perfect place to get some peace and quiet. Located off the north Antrim coast, you will be treated to gorgeous views and deserted beaches no matter which direction you wander. April to July is puffin season, so it is well worth planning a visit to coincide with that. Don’t miss: Despite the island’s small size, there is a great 4-mile walking trail that takes in all of the major sights. Full details of the Roonivoolin Trail can be found in the Walk NI website. How to get there: Rathlin Ferry runs a regular service from Ballycastle. Check out the Rathlin Ferry website for further information. Where to stay: In addition to the village pub there are an impressive number of places to stay on Rathlin. Our favourite is Cosy Cottage, which as its name suggests is nice and cosy!! It has no electricity which means you have no choice but to switch off and leave the outside world behind! We also love Kinramer Cottage which is a bunkhouse located on an organic farm. Being remotely situated, Kinramer offers a real chance to ‘get away from it all’ but, with a well-equipped, self-catering kitchen, central heating and two washrooms, this bunkhouse suits families, groups or sharing individuals at all times of the year. Where to eat: The community co-op shop stocks a good selection of basics and the Kinramer fishing boat supplies the catch of lobster, crab and fish available at Rathlin Island Seafoods, by the harbour. You can also treat yourself to fresh eggs from our Kinramer’s ‘Cleggan Cluckers’ or some honey from their heathery hillsides. If you don’t feel like cooking, you are guaranteed a good feed at either of the island’s tw0 restaurants – Mc Cuaig’s Bar and The Water Shed. 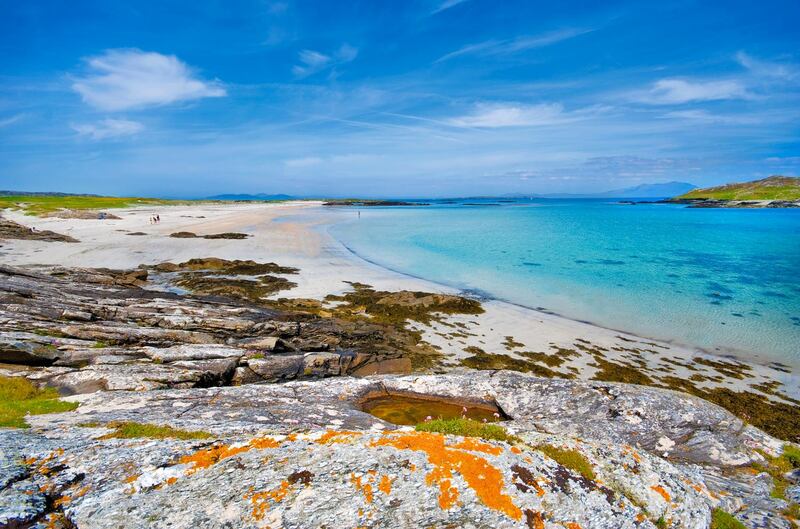 Situated 14.5km from the mainland, Tory is one of Ireland’s most remote islands. Steeped in history, mythology and folklore, Tory is home to an Irish-speaking community of just 130 people who funnily enough are led by a king; a fellow islander elected by the people. Tory must be visited if you want to really see the rugged beauty that holds such an attraction for its inhabitants that they endure the full fury of the North Atlantic winter for the pleasure of living here in summer. The island is home to incredible swimming spots, walks and diving too. 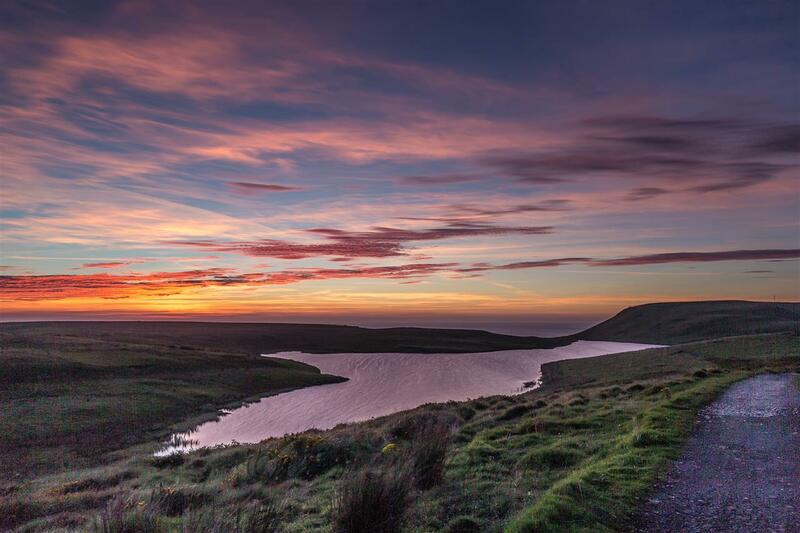 Don’t miss: The sunsets on Tory Island are mind-blowing. Dress up warm, grab a bottle of wine and a pal and head outside to watch the sun sink right into the Atlantic. Getting there: Access to Tory Island is by the Tory Island Ferry from Bunbeg and Magheraroarty Piers (Phone: 00353 (0) 74 9531320/9531340). Both ports are situated off the N56 and can be driven to via the towns of Letterkenny and Dunfanaghy. Where to stay: The Tory Island Harbour Hotel is the island’s biggest with 12 en-suite rooms. It is also home to one of the island’s two pubs – The People’s Bar. The second pub is called Club Sóisialta Thórai and together they are the foundation on which the island’s social life thrives. Clare Island, the largest of the Mayo islands, is a real microcosm of the mainland – it has beaches, cliffs, mountains all within a relatively small area. Located off the Mayo coast at the entrance to Clew Bay, its spectacular cliffs are home to large numbers of nesting sea birds and its hills, bogs and woodlands make it ideal for hill walking. 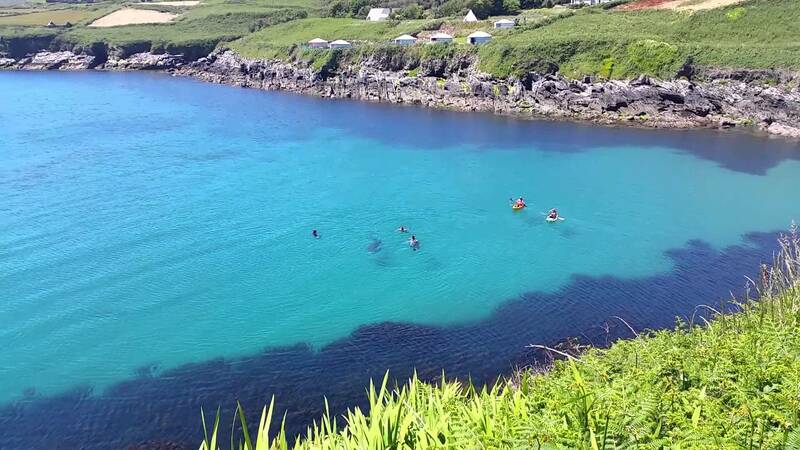 Clare Island Adventures also offers an abundance of activities from snorkelling to coasteering and kayaking. There is also a yoga studio on the island for those looking to unwind. Don’t miss: Rent a bike, throw your togs and a picnic in your backpack and go explore – we guarantee you will find a little slice of heaven that you can have all to yourselves! Be sure not to miss the Grainne Uaile castle and the small Abbey which is home to impressive murals (the neighbouring cottage has the key). Be sure to finish up your day at Sailor’s Bar for some fresh fish and a bit of craic to boot. Getting there: Clare Island can be reached by ferry from Roonagh point Louisburgh in Mayo. 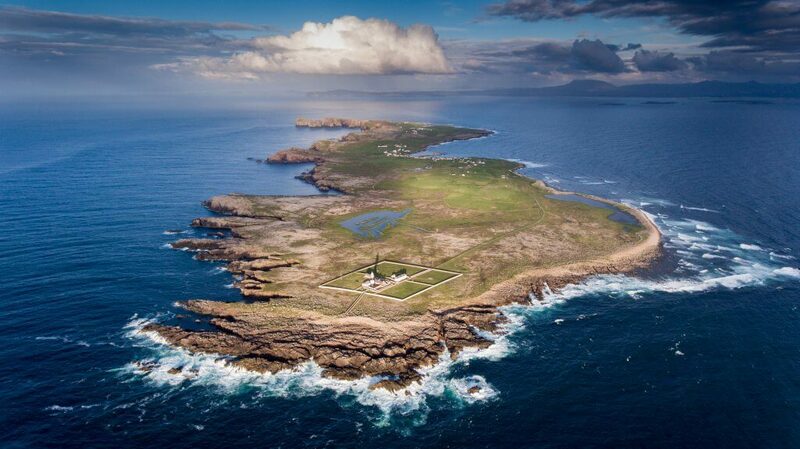 Where to stay: If it’s a little luxury you’re after then we highly recommend the Clare Island Lighthouse. Standing guard at the entrance to Clew Bay, this listed building has been transformed into a fully catered boutique hotel with magnificent sea views. 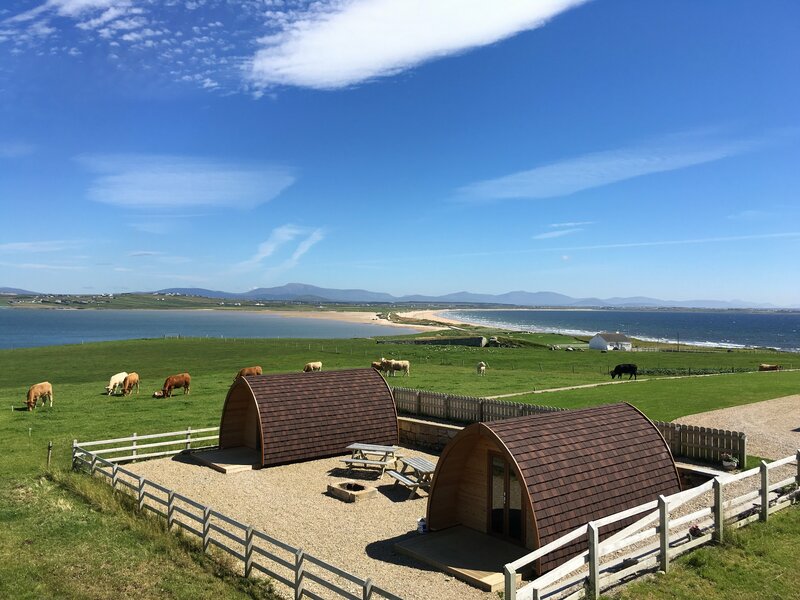 Another more wallet friendly option is Clare Island campsite which costs just €10 per night and is located right beside the pier and Sailor’s Bar. The site is little more than just that, however, it does offer toilets, fresh water and cold showers! The hostel adjacent to Sailor’s Bar is also a cracking choice for those on a budget. Uninhabited since 1957, this tiny island off the coast of Galway guarantees complete rest and relaxation. There is one renovated stone cottage on the island which sleeps 11 people but there are no shops, pubs or restaurants so you really will have the place all to yourselves! Don’t miss: The glorious white sand beaches and crystal clear waters on Mason Island are a wild swimmers dream come true. Getting there: There are no ferries to Mason Island, however, the owner of the cottage offers lifts in his Curragh. Where to stay: Shamrock Cottages offers a renovated stone cottage just 100m from the stone pier. Sleeping up to 11 people it is perfect for a group and has full cooking facilities etc – just be sure to bring supplies from the mainland, there isn’t a shop in sight! A trip to the old Belmullet Coastguard Station on Claggan Island is a must when travelling to north Mayo. Accessed by car via a sand spit at low tide, the journey out there is an adventure in itself. Surrounded by the sea, there are a few places more wild or remote. This is a place where you can go to sleep and wake up to the sound of crashing waves, a place where the word stress simply does not exist! Don’t miss: Tucked away on the north coast of Mayo lies the tiny village of Carrowteige, one of Mayo’s most remote Gaeltacht outposts and home to some of the most spectacular cliffs along the Wild Atlantic Way. There is a glorious trail that runs right out along the headland and hidden swimming spot where a waterfall rolls off the land and into the sea that has to be seen to be believed – it is the definition of paradise. Check out our comprehensive article on North Mayo for more information. Getting there: You can drive over to Claggan at low tide. Laurence from the Coastguard Station will provide you with information on tide times and the best route across the sand! Where to stay: The Old Coastguard Station is now home to a beautiful self-catering house and two luxurious camping pods. Run by the two lovely Laurences (a father and son team), and Laurence Junior’s wife Myra, you can go to sleep to the sound of the crashing waves and wake up looking straight across the Atlantic. In summer, you can sit outside your pod, cooking sausages on the fire pit while watching the sun go down. They even provided us with marshmallows to get us started, as well as fresh free-range eggs and homemade rhubarb jam for our breakfast. Yum! Located just a short ferry ride from the quaint fishing village of Baltimore in West Cork, Sherkin island boasts some of the best scenery in Ireland. With white sandy beaches, never-ending views of the crashing Atlantic and rich flora and fauna throughout, you will struggle not relax here. The island does have a buzz in summer, especially during the sailing regatta in late July and the annual music festival in August, however it’s not hard to steer clear of the hustle and bustle. Simply rent a bike at the harbour and within minutes you’ll be lying in a sandy cove without another soul in sight. Getting there: There is a regular ferry service from Baltimore harbour which costs €10 return for an adult. Where to stay: The Islander’s Rest hotel offers rooms for €60 per person sharing during high season. 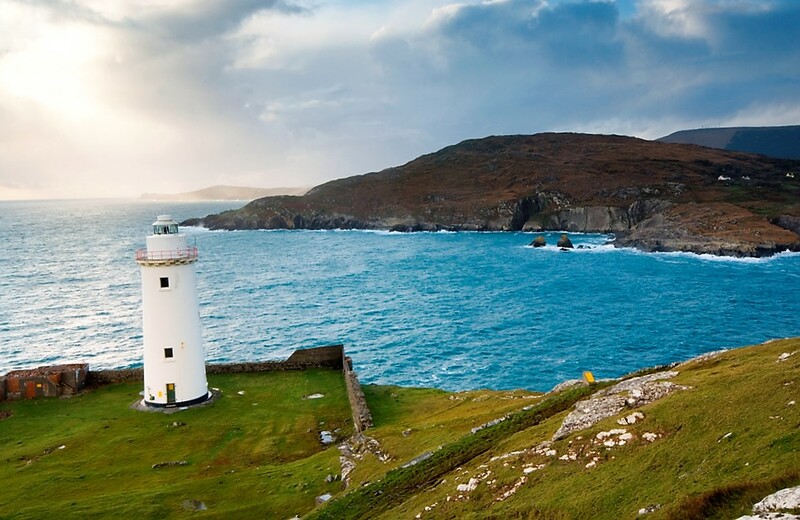 Cape Clear is Ireland’s sourthernmost inhabited Gaeltacht island located eight miles off the coast of West Cork. At just one mile long and three miles wide, it is not exactly huge, but what it lacks in size it definitely makes up for in beauty. Home to bustling harbours, dramatic sea cliffs and certain wildness to the landscape, the island is also home to some incredible wildlife – whales, leatherback turtles, sun fish, dolphins and sharks are all regularly spotted in the surrounding waters. Don’t miss: Outdoor-lovers are well catered for on the island with an abundance of activities on offer – you can choose from kayaking, snorkelling, fishing and diving, all of which are available. Getting there: A regular ferry runs from Baltimore. Where to stay: There is a limited amount of B&B accommodation on the island. We highly recommend the glamping option at Cheire Haven. Located right on the water, it offers some pretty epic views. When it comes to good grub, we can’t recommend Sean Rua’s Seafood Restaurant and Pizzeria enough. Bere Island has a rich history as is evident from the abundance of archaeological sites including ring forts, standing stones, wedge tombs, Martello towers and the old military barracks. In addition to this, the island has its fair share of natural assets too. Located at the entrance to the magnificent Bantry Bay, the island sits under the shadows of the Slieve Miskisk and Caha Mountain ranges on the Beara Peninsula. Don’t miss: The island is home to 20km of the Beara Way, two sandy beaches and some beautiful sea kayaking for those wanting to combine their relaxing break with a little bit of exercise. Getting there: You can reach Bere Island from Castletownbere via ferry. Where to stay: Bere Island Holiday Homes are the perfect option if you’re travelling in a group. These self-catered four-bedroom homes are ideally situated and offer cracking views across the water. Bid farewell to your beloved mod-cons, and hello to life ‘off the grid’. What the Blaskets lack in electricity and infrastructure however they make up for in rugged beauty. The island itself consists of mainly mountainous terrain which sits against the dramatic backdrop of the crashing Atlantic below on the most westerly tip of Europe. You can walk the unique system of unfenced green roads – grassy tracks previously used by the Blasket islanders and these days kept trimmed by the island’s sheep, rabbits and hares. 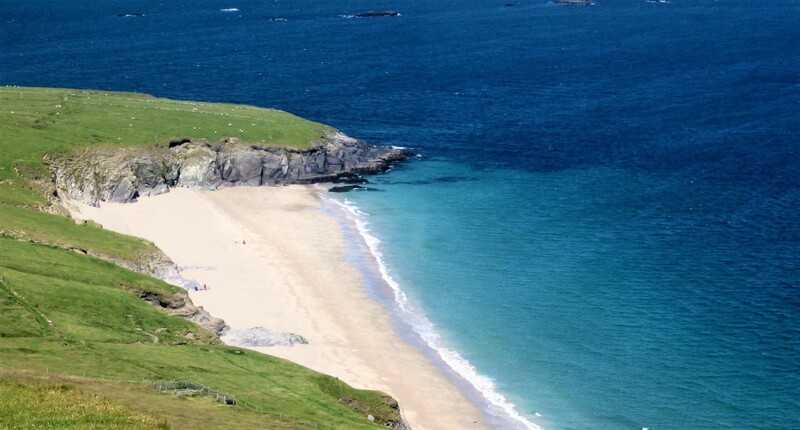 Be sure to take a stroll down An Trá Bán (White Strand), the pristine island beach, and take a dip in the refreshing Atlantic waves. Those looking for something slightly more taxing can opt to hike around to the back of the island where amazing views over the other islands of the archipelago, amongst them Inis Tuascairt and remote, cone-shaped Tearacht await. Where to stay: Unique Islands Lodgings, is as its name suggests, pretty different to your average B&B. But what it lacks in home comforts, this place makes up for in incredible views, complete peace and quiet and a refreshingly sedate pace of life. Beware, there are no shops on the island so you must take everything you need with you from the mainland, including a torch as there is no electricity. There is an eco-shower on site, but this is not always hot so you may want to pop a packet of baby wipes in the bag too! 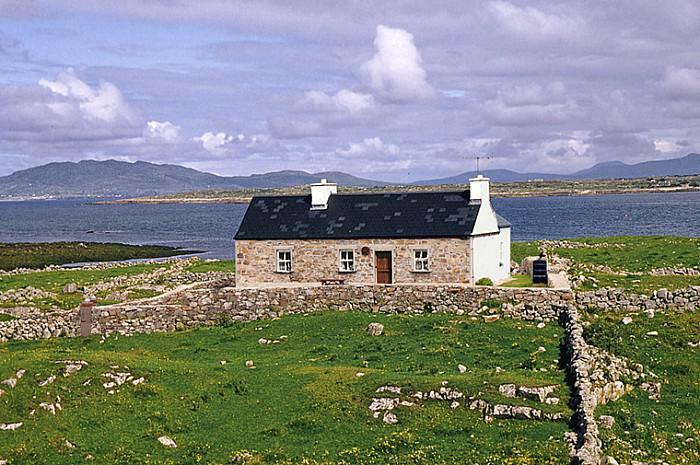 Inishbofin is one of our favourites on this list. From the moment you step off the boat, you feel like you are transported to somewhere far further than you have travelled. Bursting with character it is home to white-sandy beaches and tropical coloured waters. And fear not, there is plenty to keep an active soul occupied here – from bikes and hikes to kayaking, diving and fishing you definitely will not get bored. Don’t miss: The island is home to five restaurants and four bars in which you can find lively trad music sessions almost every night of the week. Getting there: There are three sailings per day during the summer months and two per day during winter from Cleggan Pier in Connemara. 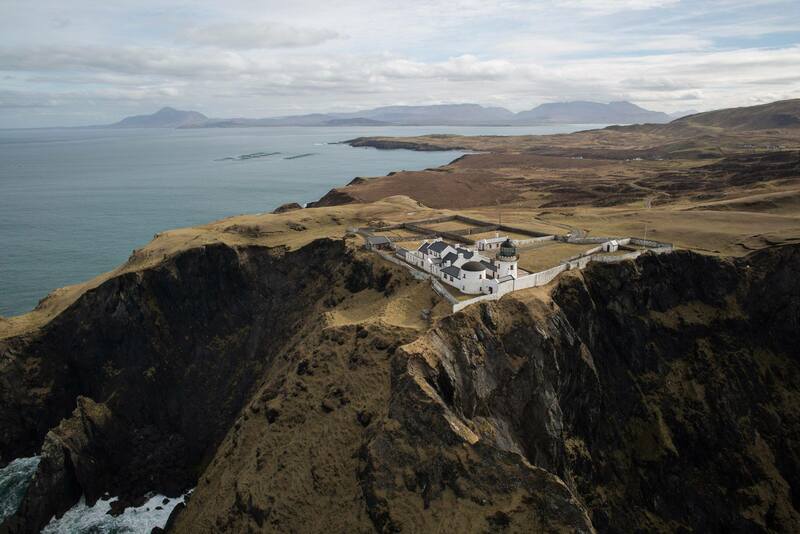 Where to stay: The Inishbofin House Hotel and Marine Spa is great for those looking for a spot of island luxury.